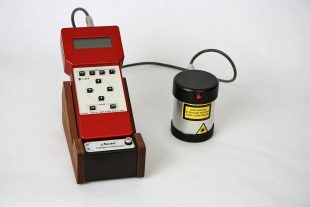 The MicroScan (μScan™) Scatterometer is a rugged hand held scatterometer manufactured by The Scatter Works, Inc. It is providing a fast, non-destructive way to monitor surface roughness and optical characteristics, so it allows you to quickly monitor surface degradation. It can be used on mirrors, various reflectors and precision machined surfaces. It finds use in lab, field and manufacturing environments. A common use is in-place monitoring of large difficult to move surfaces (such as telescope mirrors). Another is surface finish quality control inspection of large manufactured sheet products (rolled metal, coated glass, etc) on the manufacturing floor. Results appear on an LCD screen and are saved internally. The μScan System consists of a hand held Control Unit (CU), an interchangeable measurement head, and a separate charging unit. The CU controls all aspects of the system operation. Operators place the measurement head on the surface to be measured and presses a button, each measurement takes less than five seconds. From a single measurement, a user can determine RMS surface roughness, Reflectance and scattered light level (BRDF) on flat or curved surfaces under any lighting conditions. The results are digitally displayed and stored in system memory. Software is available for control, analysis and file conversion. The optional available PC Software downloads files to PC for statistical analysis of data. It provides a selection of on board process control limits, formats data and statistics for printing and converts data to ASCII format. Additional it provides PC control of the μScan.